We are super excited the 2019 Sunway Safaris brochure is available online or if you are a New Zealand resident we can post one to you (see details below). 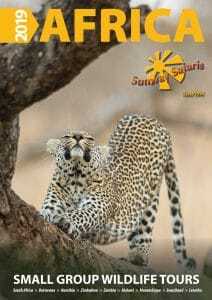 Since 1994, Sunway Safaris has specialised in small group safaris throughout Southern Africa. Proudly 100% African owned and operated they now run more than 300 safaris each year on 30 different routes through 10 different countries. Indafrica Travel is Sunway Safaris representative office in New Zealand. We have personal experience of the safaris and Sunway’s operations so you can feel confident when talking to us about what to expect when joining a Sunway Safari. We can provide advice on when to travel, which is itinerary best fits your safari dreams, what to pack, visa & health Requirements, tipping guidelines as well as how to book. Why book a Sunway Safari? Sunway’s Fabulous Guides: Group leaders are key to the success of any safari. On all Sunway Safaris (excluding Expeditions) you will travel with two qualified and registered field guides, rather than one guide and a driver. Guaranteed Departures: All dates should in BOLD in the brochure are guaranteed to depart so you can book your safari with confidence. All other dates depart with a minimum of 4 people. All Inclusive Pricing: Each safari includes the best inclusions and experiences such as game walks with local scouts or exploring Botswana’s Game Parks in an open 4WD. All entrance fees are included and a wide range of activities. There are no “activity packages” bumping up your tour price. Saftey: Where ‘backyard built vehicles’ are still the norm, Sunway Safaris vehicles are custom built by an authorised passenger vehicle builder to meet the latest safety requirements. Solo Travellers: Travelling solo will not make your holiday more expensive if you are willing to share with a same-gender traveller on their Adventure Camping, Affordable Accommodated and Expedition Safaris. If you prefer to guarantee your own room then a single supplement will apply. Experience: Sunway Safaris team live in Africa, travel in Africa and have a passion for their amazing continent. With more than 25 years of experience in planning and running tour throughout Southern Africa, they can ensure you are booking on a well-planned safari that will give you rewarding experiences in the countries you visit. Ready to start planning your safari?